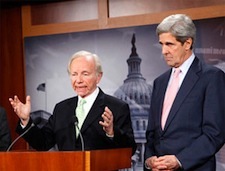 The Kerry-Graham-Lieberman climate bill that was to be officially proposed in the Senate on April 26 is now scheduled for unveiling this coming Wednesday after a two-and-a-half week delay, but this time without the endorsement of Republican Senator Lindsey Graham. Graham withdrew his collaboration, if not his tacit support, of the bill last month when he voiced pointed concerns over the possibility that Democrats might pursue controversial immigration ahead of the climate bill, further imperiling Graham’s already tenuous standing with his Republican colleagues. It is a price Graham must pay for daring to work with Democrats in the spirit of addressing vitally important issues. Within days of Graham’s departure, the tragic explosion of the Deepwater Horizon offshore drilling platform in the Gulf of Mexico was transformed into an environmental and economic disaster of historic proportions. With national attention suddenly focused on energy and the safety of offshore drilling, the climate bill seems for some even less likely of making any headway – even debated let alone passed. At least that is Graham’s view in response to Senator John Kerry and Joe Lieberman’s announcement of their plans to move ahead with release of the bill this Wednesday, May 12. I believe there could be more than 60 votes for this bipartisan concept in the future. But there are not nearly 60 votes today and I do not see them materializing until we deal with the uncertainty of the immigration debate and the consequences of the oil spill,” Graham said in a statement. That’s not to say that Graham doesn’t feel a need for renewed energy and climate policy. But even if he doesn’t say it in so many words, the fact is that Washington is simply too broken, the political parties too fractured and polarized by idealogical extremism, and the events on the ground (more specifically in the Gulf) too overwhelming to even try. That’s not how Kerry and Lieberman see it of course. They predict they can still be successful in gathering the 60 votes needed to pass their energy and climate legislation, even without the active support from their former partner. And what about offshore drilling? As the bill has developed over the months, it has generally been considered as an “industry friendly” proposal, promoting “clean coal” technology, nuclear energy, and increased offshore drilling for oil and gas. It doesn’t appear, however, that the damaged and ineffective blowout preventer laying useless at the bottom of the ocean will allow for a time out. Whether rational, effective, and sustainable energy and climate policy is achievable in such a dysfunctional political climate remains to be seen, but it is clear we are on a path to ruin should we continue as we now are.